Explore the western canyons of Sedona, Arizona on this guided, 3-hour, 4x4 tour. See this desert town's red-rock buttes, steep canyon walls, and pine forests — a scenic drive full of fun for the entire family. Along the way, learn about the history of the area, the rock formations, and the local traditions. Choose from one of several departure times throughout the day. 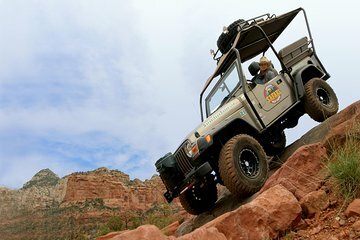 This 3-hour tour begins 15 minutes prior to departure at the Arizona Safari Jeep tour office in Sedona. Choose from one of four possible tour times — 9am, 11am, 1pm, or sunset. Then board a 4x4 Jeep and embark on an adventure in this Arizona desert town, located an hour south of Flagstaff. Enjoy the scenic view while the tour guide drives through Sedona and into the Coconino National Forest, a 1.8-million acre, United States National Forest. Coconino is one of the most diverse National Forests in the country, with landscapes ranging from the famous red rocks buttes of Sedona to Ponderosa pine forests, and from southwestern deserts to the alpine tundra. Explore the mountains and canyons, and look for local wildlife. Along the way, stop for photographs and learn about the history of the area, the rock formations, and the local traditions. The tour ends with a drop-off back at the Arizona Safari Jeep tour office.